The Car Art you will see here is in part inspired by the show Wing Nuts. Some credit has to go to my Father, and my two mothers. One of greatest influences that helped me continue to pursue the arts was my father. I see art in the creation of functional parts because of my work experience in the machine shop industry. Attaining the level of tool and die maker, my experience was limited to self training and my work never went so far as to create progressive dies. It was a field that I did love however. So when I see the parts that are functional for their purpose there is, to me an additional beauty that each creation has. A beauty is inherent in its design that becomes the basis for the steel car art sculpture. Incorporating these designs within the found pieces is the basis for my found art steel sculptures. I hope you enjoy viewing them as much as I did in creating them. At this point I regret (for those who would want them) almost all of my steel car part found art has sold out. I will start a creation process soon with even bigger, more gears and more creativity. Based on the past success, these will be even more popular. The new pieces are a few months from completion so check back. People often wonder where do these found car part art creations come from (talking of my mind I think). From my earliest days, I had a love for cars, driving and the road. I was looking in popular mechanics before I could even read. Then at 4 before I even was in school, my grandmother taught me to read. So I started reading Popular Mechanics, Popular Science and Car and Driver. I should also say that my mother was once one of the top female drivers for the a sports car club, I believe it was the SCCA in the 1960’s. My parents got a divorce before it was fashionable. Among my friends I was the only one with out both a mom and dad growing up. Instead I had either a mom or a dad and a step mom which was like having two moms. My second mom, Donna, was always there for me. My first mom was a world traveler, sports car driver and lived an incredible life. I have run into people who knew her in Thailand during the war years as well as in the states from her auto rally and auto cross days. One of her friends once told me of how she got his 1964 Triumph Spitfire up on two wheels going around the pylons at an auto rally. It was a car advertised that it could not be rolled. There was seldom an auto rally or meet that didn’t have me running around with my mother in her 1963 MG A. So with this background and being a machinist / tool and die maker, growing up around cars and sports cars at that, a father supportive of my being an artist and a second mother always there for me, I could not loose. When I see car parts I see car art. Well, let the art tell the rest of the story. See if you can identify the parts as you see them in my car art. 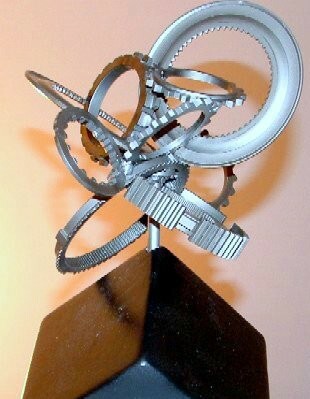 Note At times I make smaller pieces creating affordable steel sculpture so more people can enjoy. Go to See the Car Art of Jonathan Steele. Small affordable size sculptures for car lovers. Fish Sculpture Found Art hammered out of the steel from a car hood. The ultimate recycle of car part art. Two Lips is a found art Lipstick Kiss made out of the hammered steel from a car hood. Found Art Gear Mirrors are also functional car part art. They are mirrors you can use in your home. Each is signed by me, Jonathan Steele. If you like these, you might like to see some other Jonathan Steele Art. Check out the site for more art. Abstract Art Photography of Jonathan Steele is the photos of steel of among other things burned out buildings and scrap metal.